extremely beautiful wooden accents shared by someone on a Facebook community. I contacted that "someone" to see if he could show me the entire home and got to know that what I had seen was just a trailer (picture to abhi baaki thi). Below are the images that I had seen on FB. I received this message from him "kind of you to have liked our work. Altho' the picture above has been conceptualized and executed by us, it is not our home. 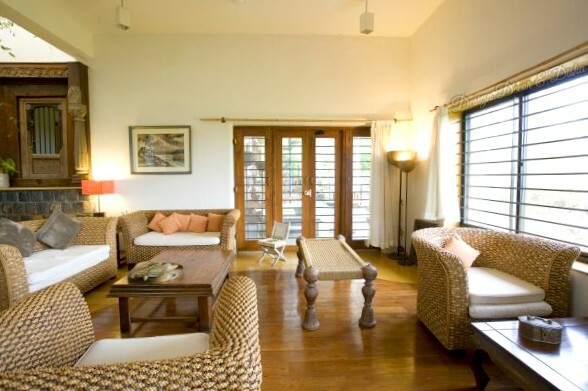 Attached are a few images of our residence. If this belongs to your 'line of work, we can have a tel con. tomorrow." 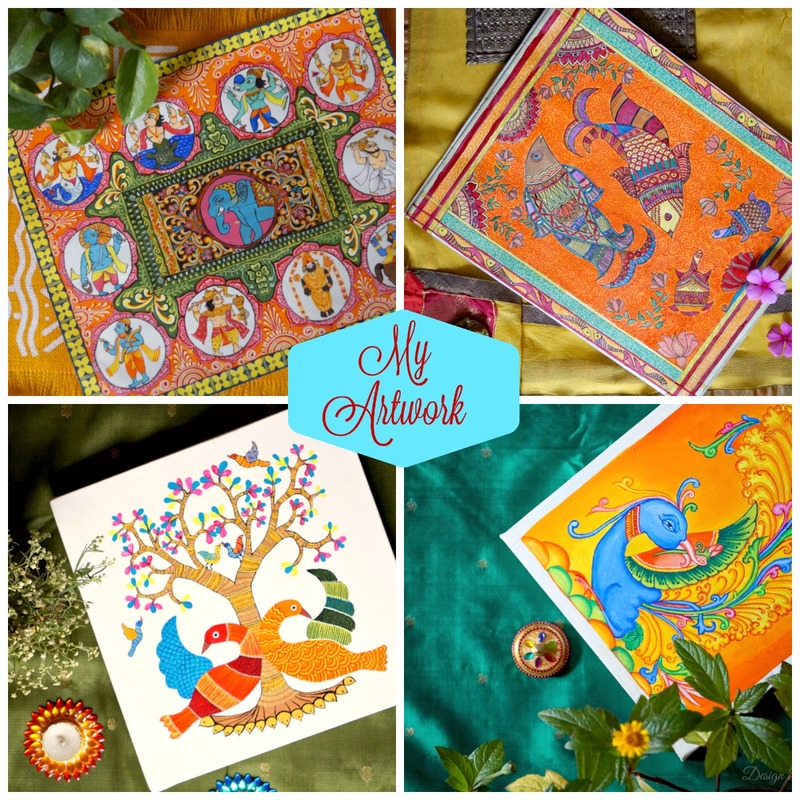 The images of his home left me speechless and spellbound. I went ahead, talked to him on phone for good 15-20 mins trying to make him understand my work as he wasn't aware of "blogging" and he then very sweetly and humbly invited me to his home in Nashik. Well, I have kept that proposal safe with me. Dear all meet Adwait Kher, one of the nicest and the most humble person I have ever come across. Later I came to know that he is a proud father of Saunskruti Kher (an actress) and Saiyami Kher (lead actress of movie Mirzya). Dear readers, let me take you all to Nashik once again to take a virtual tour of Adwait and Uttara Kher's country style home that is filled with old world charm and vintage treasures. 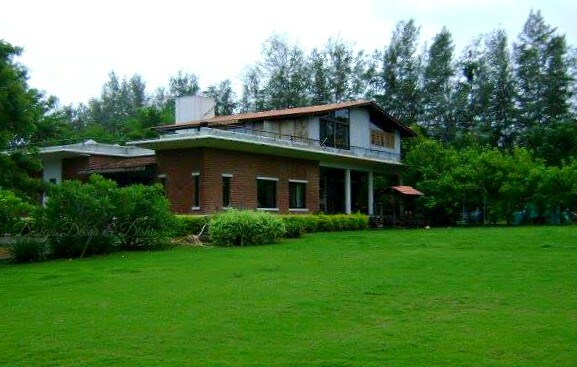 Tucked away from the hustle-bustle of the city in nature's lap amidst lush greenery and an exceptionally serene environment is this little gem. 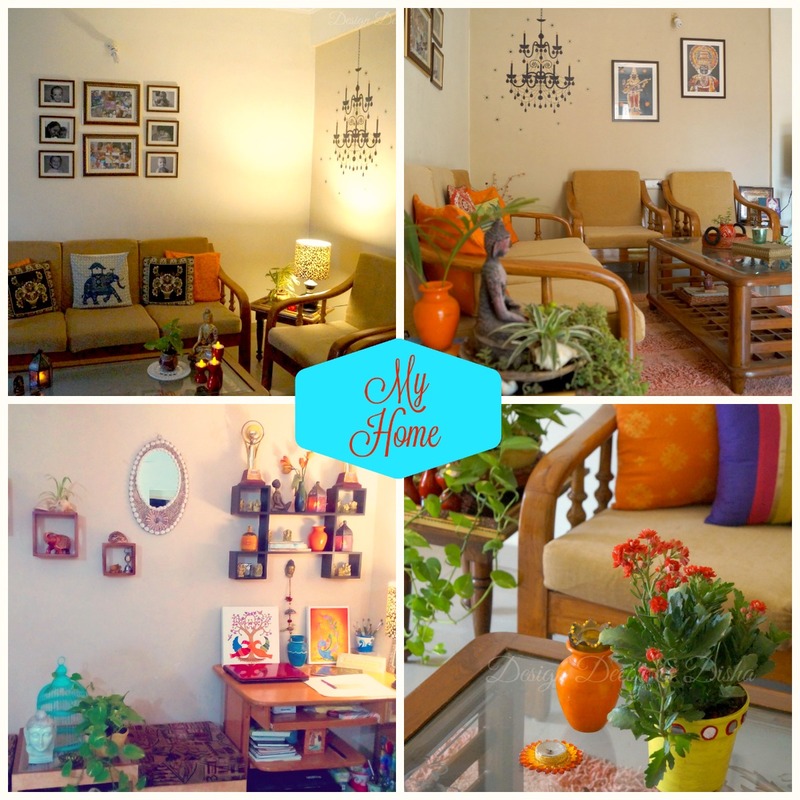 Every inch of the home reflects the sweet, warm and humble persona of the homeowners. They also own a furniture studio called Uttara & Adwait Furniture and hence most of the furniture pieces in their home are from their own collection. No matter classic or modern, a swing never fails to add that traditional element to the decor. 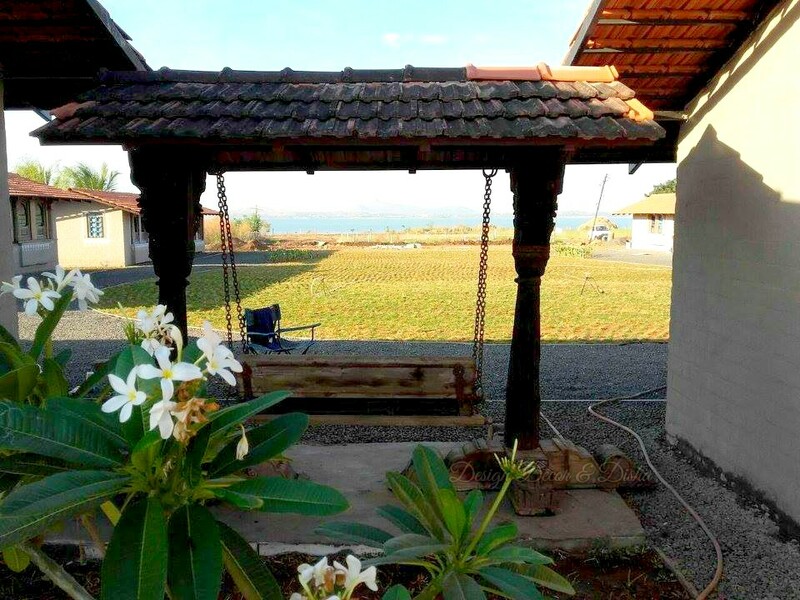 And if it is a beautifully carved teak wood vintage swing then the pleasure of sitting on it and reminiscing the good old childhood days can be an unbeatable experience. Did the porch below reminded you of your grandparents' home. Restored windows installed on the wall aren't just a piece of art, they actually serve the purpose. With exposed brick walls, stone skirting, wooden benches, trunk and vases this quaint porch is like a smile on the front of this home. 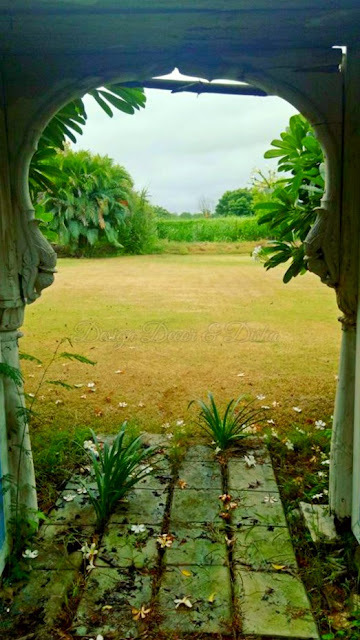 Come on in dear readers, this is the entrance to the home and you all went gaga over this image when I shared it on my Instagram. 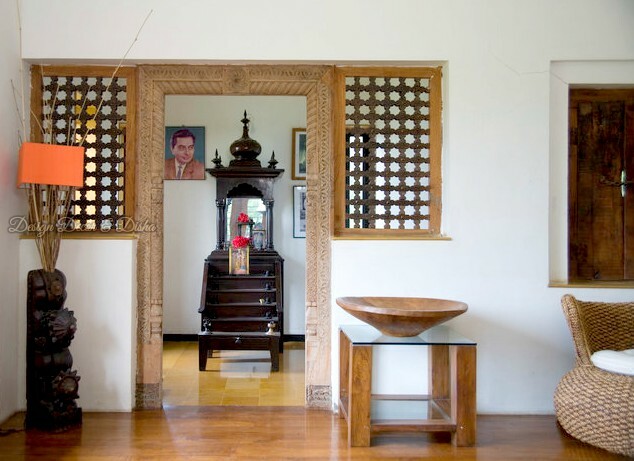 A huge carved wooden panel above the main door (of course well secured) and the openings in walls on both the sides of foyer make it look grand and magnificent. An elegant teak wood console table with woven baskets and wooden Roman numeral knobs is ready to catch the attention the moment you step in. While the colonial style wall bracket in one corner reminds of the bygone era. The right side houses a "home bar" that Adwait likes to call "bar bar dekho". Home is filled with reclaimed wood and restored furniture pieces and is a perfect example of when old meets modern. 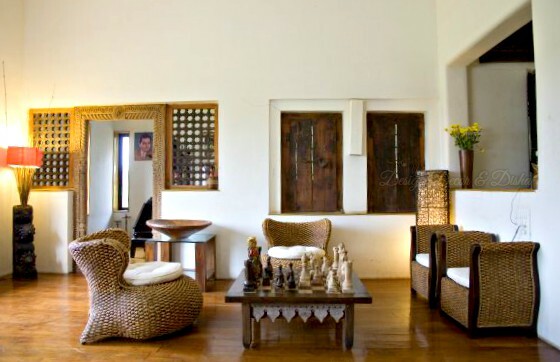 Below is the image of a small sitting area in front of the prayer room that attracts chess lovers. 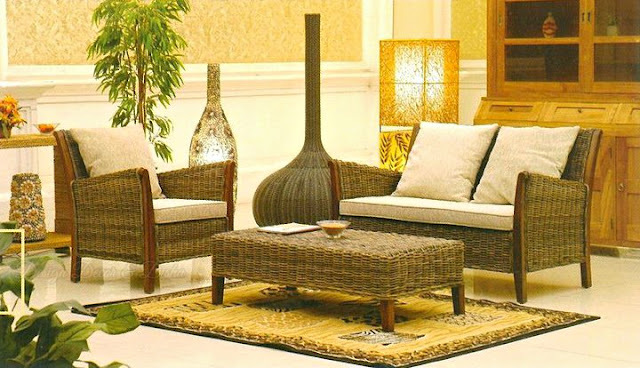 Woven furniture and earthy tones create a warm and pleasing ambience. 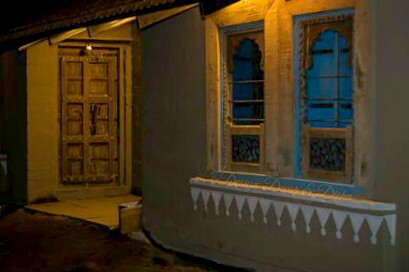 Two windows next to prayer room are the ones that you have seen in the image of the porch. Would you like to have a closer look at the chess table. Let me show you. 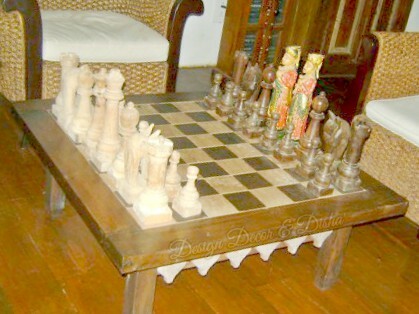 Vintage chess table and hand-carved oversized pieces are so quaint and yet so charming. Did you notice the king and the queen, what a unique piece. The sitting area extends into this drawing room which is quite airy, bright and profoundly spacious. Subtle colors make it a perfect place to relax and rejuvenate. 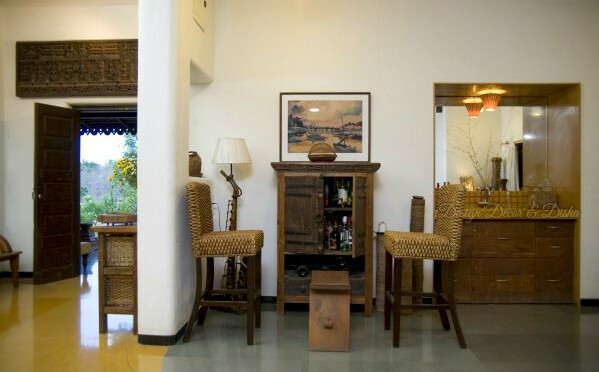 Woven furniture with gentle sloping curves, layered with soft white seat cushions and paired with long khatiya/charpai(bench) add gorgeous texture and dimension to the room and make it look both modern and country style at the same time. 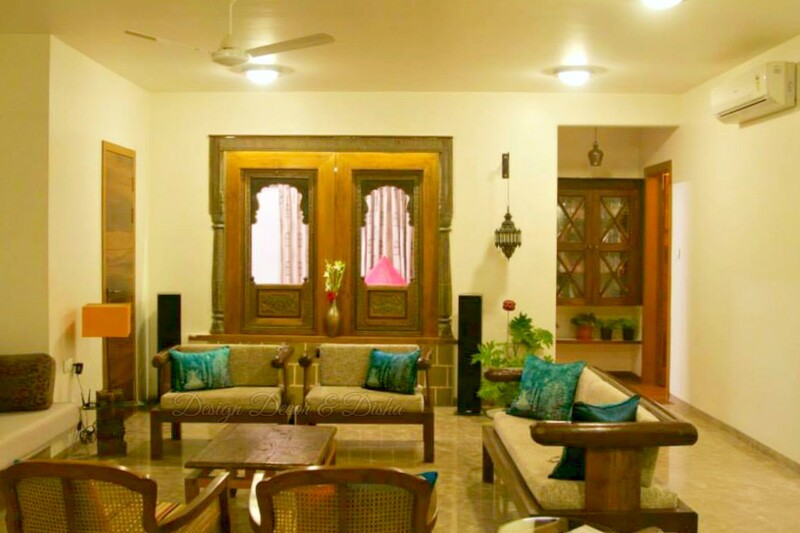 So those of you who had chosen to stay in the bar (towards the right of the foyer) Come on it's time to move ahead and check out Khers gorgeous dining room which is filled with warmth and of course old world charm. Woven furniture ties all the rooms together in this home and sets the theme whereas wooden accents and vintage windows are a great addition to the country chic decor of this home. A splash of color is added using table runner and mats. The sky window right in the middle of the home not only is a source of ample natural light but also offers an opportunity to bring nature inside. 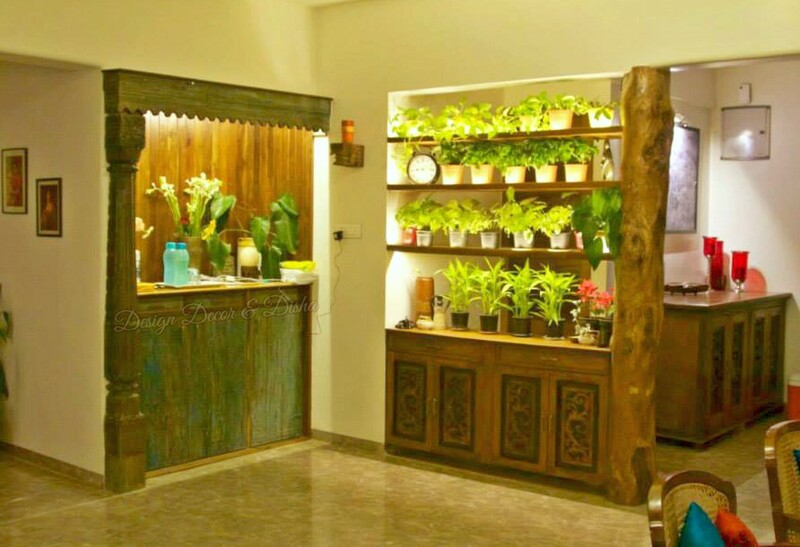 Organic and natural elements here make us feel calm. There is nothing like the smell of wet earth and sight of fresh green nature and that's what you can see and feel in this home. The bedroom is a clutter-free space done up in calming colors with a pop of ochre and fuchsia. 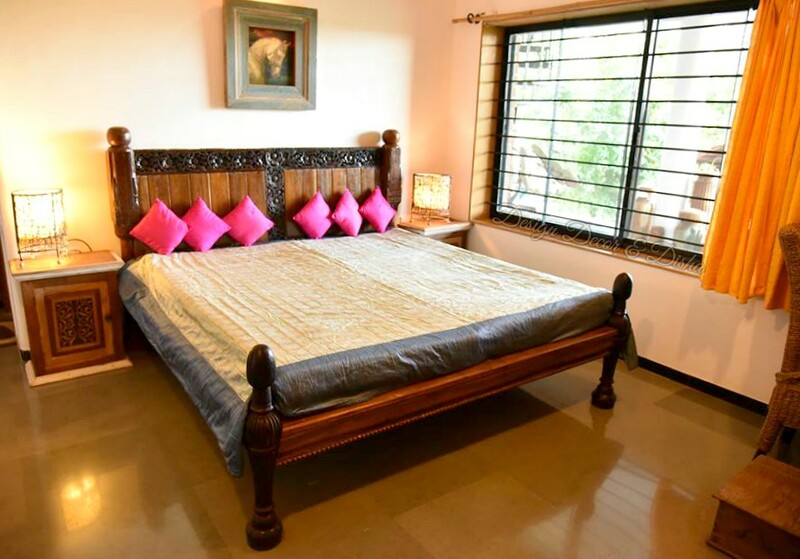 The bed is made of carved teak wood. Clean lines and minimalistic decor open up the space. 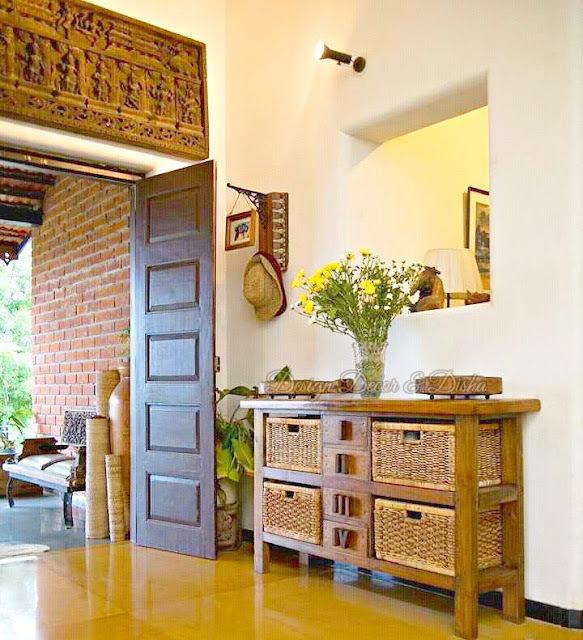 The couple's love for vintage pieces and wooden accents is quite evident throughout the home. 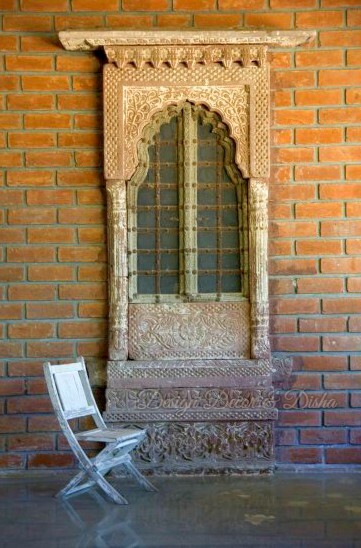 An intricately carved exquisite reclaimed window installation on the exposed brick wall in their table tennis room is a conversation starter. 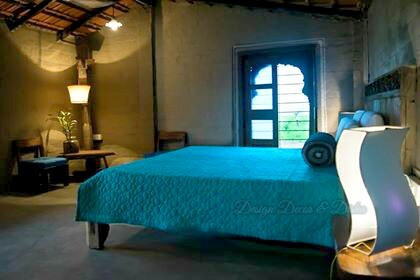 Uttara & Adwait Furniture studio. 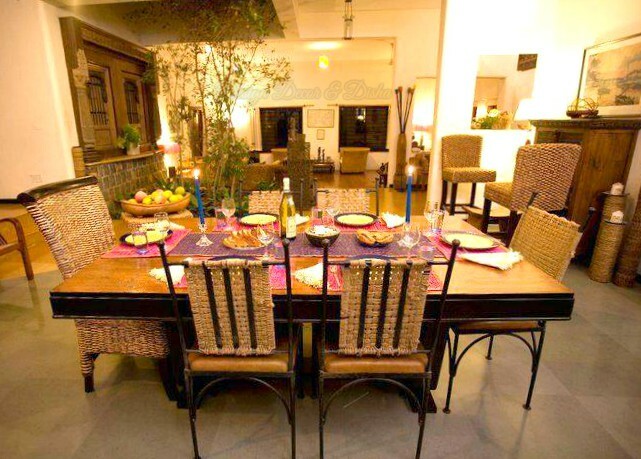 Their furniture studio is strewn with elegant furniture pieces. 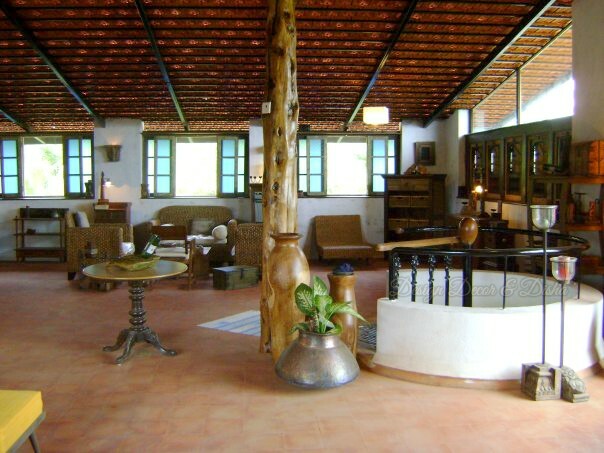 Collected from across the globe reclaimed and restored wooden accents, vintage articles and woven furniture is their speciality. What you see below is their far east collection. Uttara & Adwait have successfully completed many interior projects. 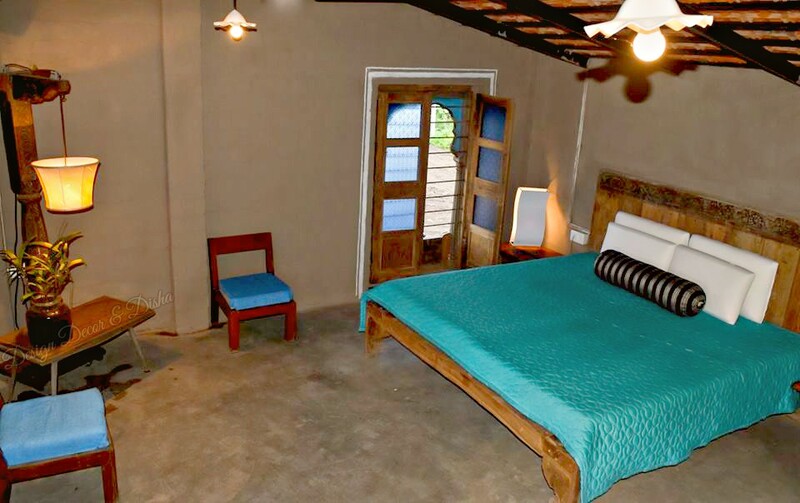 Their new venture is a farmstay. Let's check out that too. Far away from the noise of Nashik city and close to the vineyards and lake is a newly built farm stay named Utopia. 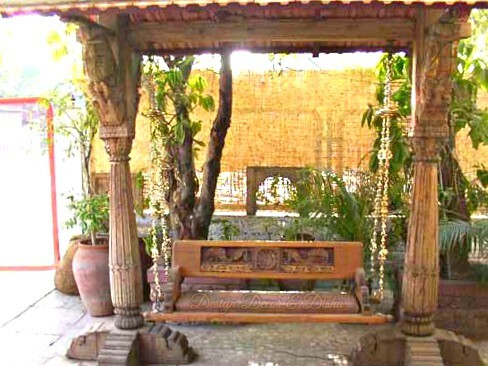 If you plan to visit Nasik make sure you check out this place if you want to spend some peaceful time in nature's lap. Hills in the backdrop, lush green carpet of beautiful grass, the gentle sound of flowing water and melodious sound of the chirping birds what else can be more relaxing and soothing to the soul. 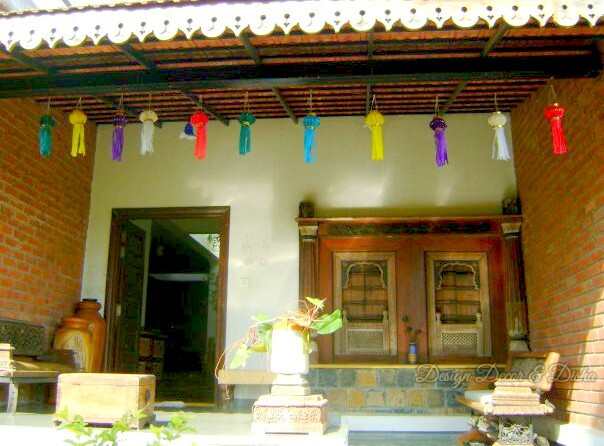 The Khers have designed the farmstay in country style. 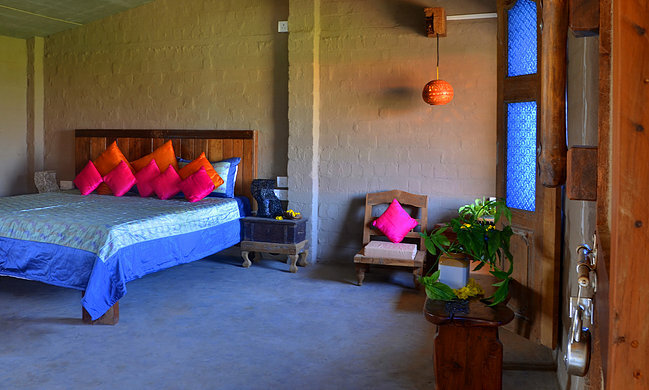 There are ten cottages that are well equipped with modern comforts while maintaining the natural essence. 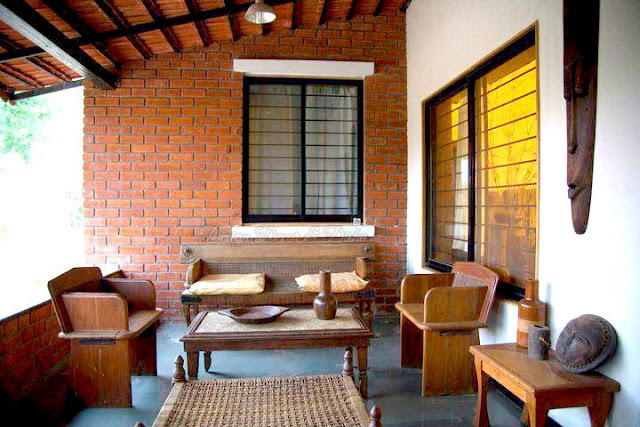 With its true rustic style exteriors and interiors, Utopia is an authentic farm stay experience. Bedrooms are designed keeping comfort in mind. Hence open space, neutral shades with the right amount of colors and eye-pleasing decor accents make this bedroom a perfect sleep sanctuary. Here is one more bedroom with soothing colors and peaceful ambience. I bet once you feel the experience of staying here, you would definitely want to go time and again. This brings me to the end of this entire feature. Hope I didn't disappoint you. 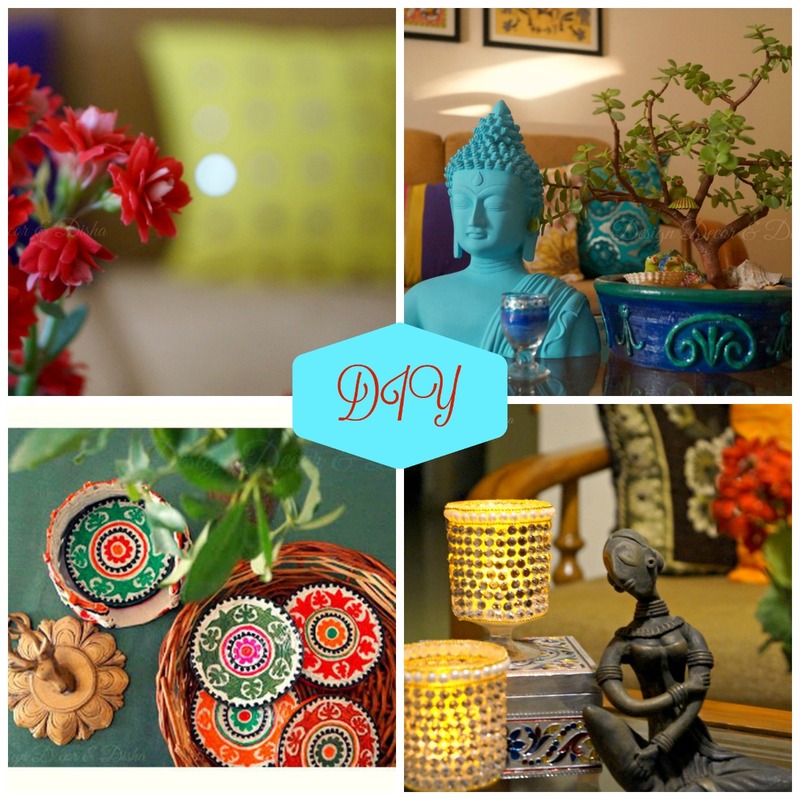 Make sure whenever you plan to visit Nashik check out this amazing place called Utopia. 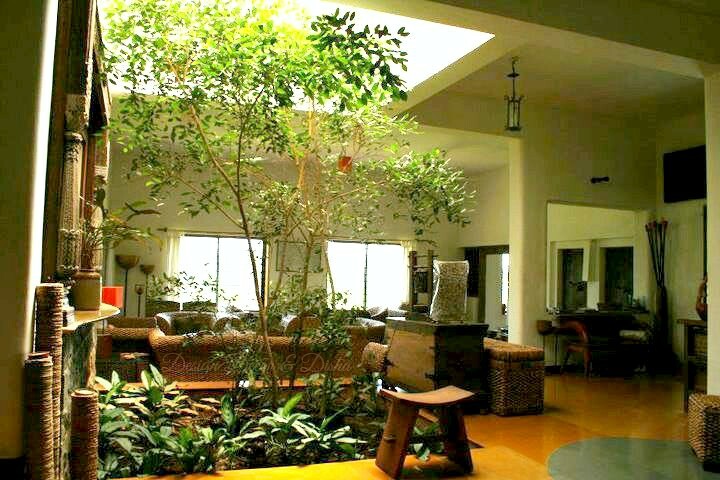 If you are still craving for more beautiful homes then click here. P.S: All the images belong to Adwait Kher and subject to copyright. Please seek Adwait's permission before using any image. Thanks!! !